Pour the oil into a large nonstick skillet, setting the heat to medium-high. Once the oil’s hot, add in the sweet potato, stirring now and then for 3 minutes. 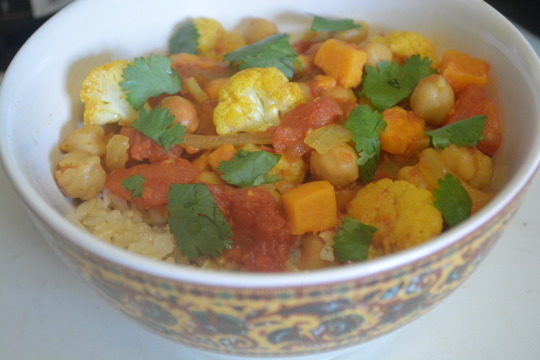 Turn the heat down to medium and add the cauliflower into the skillet as well as the onion and curry powder. Stir the mixture continuously for one minute before stirring in the broth, ¼ teaspoon salt, chickpeas and tomatoes, waiting for the dish to come to a boil afterwards. Once boiling, put a lid on the skillet and turn the heat down low enough for it to just simmer. Let it simmer for 10 minutes or until the vegetables are tender, stirring now and then during that time. While the curry is simmering, cook the rice according to the directions on the package they’re in. Take the cooked rice and place it in a mixing bowl, adding in the last ¼ teaspoon of salt, stirring to combine. 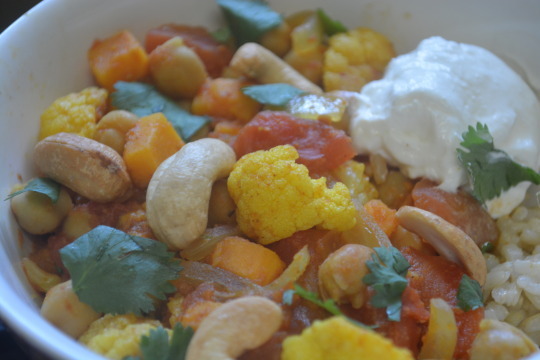 Once the vegetables are tender, split the rice evenly between 4 bowls, topping it with the curry vegetable mixture, yogurt, cashews, and the cilantro. This is a wonderful comforting dish to enjoy ! This curry stands on its own but you can choose to add on the toppings and have another layer of flavor and textures. The yogurt does add a creamy texture to the dish but the curry is great without it and omitting the yogurt makes this a vegan curry ! We got this recipe from Cooking Light. We weren’t paid in any form to promote Swanson, Uncle Ben’s, or Cooking Light.